One of the things I’ve noticed in recent years is the growth of all kinds of “Post-_______” Christianity. By this I mean varieties of Christianity that are all generally within the Evangelical Protestant genre yet explicitly do not embrace any particular tradition. Typically, what this looks like is something recognizably Evangelical yet with a potpourri of different doctrinal, worship and pastoral emphases and elements. We might see old standard hymns alongside modern pop CCM, yet with bits gleaned from historical Christianity, as well. This differs from standard Evangelicalism in that it is vocal about how it is not bound. It’s comfortable being a hybrid based largely on what an individual Christian or (often) church planter feels speaks especially to him. It might be an individual choice or even a whole community following what they see as a complicated yet honest path—though perhaps not quite authentic, because, well, how would you know? It might be someone who finds himself attending a church with a denominational affiliation yet who does not see himself as defined well by it. And it might be a church whose leader struggles to find the way as he reads a Bible that can sometimes be opaque to him. It could well be a collection of ideas and practices that a Christian is into, and perhaps he feels that he is into those things because it’s God’s will. There’s a lot of irony, a lot of confession, a lot of feeling crippled in some way. And there’s probably also a fear that embracing a tradition means rejecting people. And is that what Jesus did? I’m not talking about this cynically or to mock what might otherwise be dismissed as “cafeteria” Christianity. The difference here is a sense that all the old systems of doctrine and denomination just don’t seem to work. But instead of heading in a fully Charismatic direction where experience matters and doctrine doesn’t so much, the Post-_______ Christian basically sees himself as doing the best he can with a broken, chaotic, confused Christian world where he probably wonders just what happened to the certainty he used to feel within the Biblical hermeneutic of his upbringing. A lot of Post-_______ Christians I’ve met were raised within more clearly defined traditions but became disillusioned by them. Some saw cracks in their denominational doctrine or culture or leadership. Some were exposed to teachings from Christian history or from other traditions and found a truth in them that just wasn’t available in their own. And some were simply burned by the bad behavior of fellow church members. Someone or something failed them. Even if it was just ideas. But they wanted to remain faithful to Jesus Christ yet also faithful to the truth they found outside their previous tradition. But because they can’t trust any label, any denomination, any one tradition, they find themselves picking through the ruins of half-abandoned or half-considered Christianities to find what relics they can or to see some light shining through old windows, however dirty. I admire the honesty in that, but I cannot be that. There’s a reason why I cannot do that. It’s not merely that I have an allegiance to the Orthodox Church. After all, I could disavow that at any time. I don’t have to be Orthodox. So my choice not to be a Post-_______ Christian isn’t just because it’s not Orthodox. Rather, it’s because I want the Church. I want the Church that is the one Jesus promised the gates of hell would never prevail against. I want the Church that is the fullness of Him Who fills all things. I want the Church that is Jesus’ Body and His Bride. I want the Church that is called out from among the nations. I want the Church that receives the glory of God, the glory given by the Father to the Son. I want the Church that is the pillar and ground of truth. I want the Church that invites every last human being into it, the Church where the Father’s will that none should perish could actually be obeyed. I want the Church where the saints of old stand next to the saints of today and commune together in the mystery of a healed humanity. All these things are in the Bible. It’s what the Bible says about the Church. But it’s very hard to cobble something together—even with the very best of intentions—and be able to say convincingly, authentically that that really is the Church that the Bible says all those things about. All the things the Bible says about the Church really are true, and they’re true of the Orthodox Church. I’m not going to argue here about why I believe that that is uniquely the case (I’ve written in many other places my critiques of other forms of Christianity), but I will plead with them to believe, to believe that there really is a Body of Christ like the Bible says—like Jesus says—where all those crazy idealistic hopes actually are true. It doesn’t mean that you don’t run into sinners of all sorts within the Church who will disappoint, disillusion and even try to destroy you. But it does mean that there really is something there. It’s all true. Really. Don’t lose hope. This is very encouraging – even for someone who is in the Orthodox Church. Thank you! This is exactly where I am. I love the church, but I often wonder where is she. Lately I find it hard not to think the church has failed in so many ways. Why? Because like so many here I stand, wandering, looking, and wondering what happened. Great article. It expresses what many feel. I’m so glad to see another post, Father. I’m a “seeker” you could say, who has been voraciously reading the past posts on this blog as a way of getting a sense of how Orthodoxy sees itself relative to the modern Christian milieu. I was raised highly conservative and liturgical Lutheran, and even spent time in the seminary, but left after reading the early church fathers, especially the Greek ones, and finding no Lutheranism there. From there, seeking the concrete, visible, ep, historical church, my wife and I became Roman Catholic, but we’ve also become disillusioned there with the modernism, bad liturgy, and rampant feminism and heresy in the Church. In a sense, even in a non-evangelical setting, I feel sympathy with the sentiment expressed in this post, as I sometimes feel like I’m picking my way through what appear to be the ruins of a more churchly side of the western tradition. My wife and I entered the catechism class at an Antiochian Orthodox parish two weeks ago. I pray that we have found the church, not because I love the liturgy and beautiful tradition of it, but because it’s a place of unchanging truth, as opposed to the truth of Catholicism, which appears rather more mutable than I’m comfortable with. Christ is with you and in you, brother. Give it a little time. My journey was very similar and I can say without hesitation that God has been there all the way. He is a gentle shepherd. He leads us with kindness and patience and never fails those who truly pursue Him. Your desires will surely be fulfilled. Amen! Truly my experience also. He leads you in gentleness, kindness, and love. You have just summed up the reasons I left Protestantism. We started changing small things then they culminated in the big sweep and out went the baby with the bathwater. 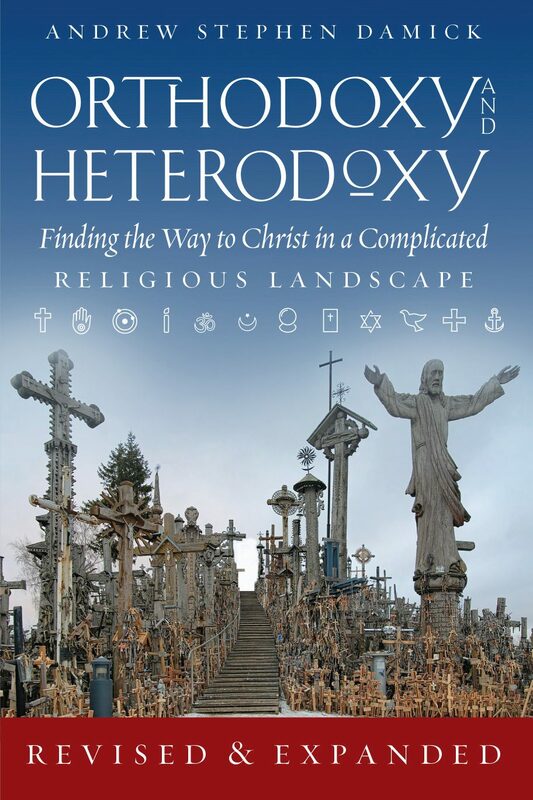 I wasn’t looking for Orthodoxy when my family came to it. After understanding the true church and not having to make my theology say, “That’s not what Paul really meant,” or try to explain away Jesus making actual wine. I have fallen in love with the church and Her ancient theology over the last two years and I know now that I can never go back to Post-Christian anything. Wonderful post! Exactly how I see things, as one considering Orthodoxy. Father, you identify the manifold problems of all of non-Orthodox Christianity in drawing attention to the Church. Neither the individualism of Protestantism nor the authoritarianism of Roman Catholicism can function as the locus of our relationship as humans to God. We are called to be one body in Christ; one people; one redeemed humanity. Being made new in Christ is a “body thing”. That body needs to know its history, its deep traditions formed by the illumination of the Saints who have gone before, its spiritual dependence upon the Holy Spirit to guide and protect and empower. Weak ecclesiology has undermined Protestantism. Mutability and wresting control from God to rigid human structures has characterized Roman Catholicism. Only Orthodoxy has been prepared to be weakness together, so that the Spirit of God might be our only strength. Those who are seduced by the Post-Something are truly seekers after the truth, but they seek their answers in the wrong places. Tinkering at the margins will provide no transformation. The answers to spiritual need lie only in the bedrock that is the Church. It is not Post-Something that they need, but the authentic pillar and ground of the truth. That which is unchanging, the ark of salvation, Christ’s Bride – She who is loved with an everlasting love and who will never be forsaken. Almighty God has provided, and continues to provide, everything humans need to be in communion with Him, now and throughout all eternity. It is incumbent upon us who have tasted the fruit of immortality to share the way. You have an excellent summary of the shortfalls of the Reform (Protestant) and Roman Catholic movements. As a recent Greek Orthodox chrismate, I share your love of the grandeur of Eastern Orthodoxy. I liken it to going through a door I did not know was there to find a banquet and I did not know I was hungry. “It is incumbent upon us who have tasted the fruit of immortality to share the way.” It sounds awfully like you judge non-Orthodox as outside the pale of salvation. If that is your intent, I must disagree. Matthew 13:15 Jesus says those who should not partake of His kingdom can not hear because, having heard they would ask, having asked they would be healed. (Ref Is. 6:9, 10). Evangelical’s do not accept anyone as one them until they have prayed the Sinner’s Prayer. In this prayer one confesses their sin, their inability to save themselves and asked God to forgive them through the shed blood of His Son. You may recognize the shape of the prayer. We say it before Holy Communian. Of course, the evangelical Sinner’s Prayer does not lead him to Holy Communion-unless he becomes part of the Community. The “is-ness” of the Church is finally unavoidable. I am grateful that my own heritage was Lutheran, I have “relics” (Kirchenbuch und Sangerbuch!) that belonged to my great-grandparents, and am involved with area clergy in a local initiative on family, marriage and religious freedom. So it is not a snooty singularity that brings profound disagreement when the subject gets to ecclesiology. With his leave, I think I would add this to Fr. Stephen’s thoughts. When our Lord prayed that the Church would be one, he meant the Church that is the Orthodox Church. It was not “invisible,” this Church. Moreover, he did not provide any “except in the case of………….,” or, “unless this Church were to……..” escape hatches. Luther’s “here I stand” was a foundational epistemological shift: the individual conscience becomes the final arbiter, replacing the Divinely instituted community. What resulted is the very problem Father addresses here. I am giving Catholics the benefit of the doubt here in the sense that before Luther’s famous challenge was issued, Christians east and west, papal and Latin idiosyncrasies notwithstanding, held a fairly unified view of what constituted “Church.” Five centuries later, one could generally say the same thing, with a few important qualifications. But to be a Protestant is to participate in an endless communal fragmentation, and that is NOT what our Lord prayed for. You have raised some profound points to which I will respond after rumination. Thank you. I was christened a Lutheran in the Missouri Synod but never confirmed. Therefore I never experienced the Eucharist until chrismation three years ago. That was transformative in a way no cradle Orthodox person or child of the Eucharistic churches could ever appreciate. Up until that day I could explain the various contexts of communion at length – and often had – with complete self-assuredness. Now I know that I have much more to learn. In 35 years of several forms protestant fellowship, I have seen what is means to be tossed “about with every wind of doctrine”. I have my own views on when and how this started, but there is no doubt that fragmentation has weakened the Christian witness and the world is the worse for it. >>Of course, the evangelical Sinner’s Prayer does not lead him to Holy Communion-unless he becomes part of the Community. The “is-ness” of the Church is finally unavoidable. Now you sound like my priest, Fr. Bill Tragus. His patience and example allowed me to find chrismation painlessly. In my humble opinion, Christians are “one body” only through the Sacrament of Holy Communion wherein we partake of HIS Body and Blood. That is, we are made one through His Body, and not through our own. Those who do not believe Holy Communion is truly Christ’s Body and Blood miss out on that mysterious unity. There is nothing judgmental, in the negative sense of the word, in stating the truth that there is One Church and One Way. Although non-Orthodox may be saved, it is uncharitable to those outside the fold NOT to invite them to discover that One Way. Father bless! Yes, yes, yes, yes, yes!!! We former Protestants were received in May 2015 & *every single thing* that my heart had cried out for all of my life is embodied and personified in The Holy Church. There is a settledness, a completeness, a depth, a richness, a beauty & rock-solid logic that quite literally doesn’t exist anywhere else in the world. Thank you for all you do, you encourage us on our journey. Great article Father. God bless you. It may be true to say, when we analyze human behavior, we find an underlying, and often camouflaged pragmatism at work. Sometimes it’s a group’s distinct camouflages which are most noticeable….without us acknowledging them as such. Take for example, the notion that John and Charles Wesley applied new lyrics to common tavern songs, sung by drunks. It may not be entirely true, but highlights cultural deference being harnessed for pragmatic purposes. Proctor and Gambles introduced the Ivory liquid dish detergent in the 1800s, and since then, in a competitive market, periodically introduces a “new and improved” version, in which the original formula inside the bottle, remains unchanged, while the outer container takes on the appearance of the new culture. The Evangelical mind follows suit by removing choir-robes, black-suits, and old hymns, with Hawaiian shirts, video-screens and rock music. Like a product on the shelf, the recipe inside the bottle remains essentially the same, while the outward form morphs, sufficient to be embraced by the new cultural. But does the church function as the salt of the world, or is the world salting the church? For me, the Charismatic realm is especially problematic. For I see it embracing a disturbing syncretism with Buddhism, New-Age, and Occult formulations. There has been an “all that glitters is gold” mindset in the Charismatic movement, where worship follows the model of Balaam offering sacrifices at high-places, salted with Occult liturgical patterns. This reflects a blatant ignorance of the difference between a Holy Spirit, and an unholy spirit. The god of this world must enjoy watching that phenomenon. Thank you for your article and wonderful web-site! Blessings!! Can you tell me what “Pdn.” stands for? As Father mentioned, it’s an abbreviation for Protodeacon, but alas! If people call you that it also means you’re old. I’m grateful to read this article as I have been learning about orthodoxy and visiting churches, taking classes and having difficulty with the logistics and discernment of everything involved to make the change from where I am to where I want go, following Him. I think I need a spiritual director very much!!! I’m a Utah educated, mission serving, temple going Mormon with a lot of questions. I don’t even know how I ended up here but this article is what I needed today. Thank you. Thanks for coming by today, Dana. It may interest you to know that I’m in the midst of major research to write a book looking at the LDS from an Orthodox Christian point of view. “Since Christ came to the Church’s place of lodging and found her unclean, filled with impurity, naked and defiled with blood, He bathed her, He polished her, He nourished her and He clothed her with such a garment that it is impossible to find another one better. Christ Himself is the Church’s garment. Since He received her in marriage, He raises her up and guides her according to this way. The inheritance has been prepared for the Church” (In Cap. XXIX Genes., Hom. LVI, 54: 487. Quoted in The Church’s Identity Established Through Images According to Saint John Chrysostom, Protopresbyter Gus George Christo (Orthodox Research Institute, 2006), p. 162). And for the record, I did experience “sinners of all sorts within the Church who disappoint, disillusion and even try to destroy” me. I just came to the realization that I am not better than any of them. You have written the words that my heart spoke. I could not say why I became Orthodox more plainly and succinctly than you did.